Hero Histories: Salute the Fighting Yank! Our story starts in June of 1941...and in 1775. At a critical point of the American Revolution, George Washington himself entrusted messenger Bruce Carter with vital information. Carter was captured, tortured, and killed by the British, taking his military secrets to the grave, and vowing to return when danger threatened the Colonies. Flash-forward to 1941, Carter's great-great-grandson Bruce Carter III, a rich idler obsessed with history sees patterns forming that will lead to the USA soon becoming involved in the World War raging in Europe and Asia! But what to do? He's only one man, albeit an extremely rich layabout! The ghost of his ancestor appears and leads him to a trunk in the attic of the Carter estate, where Carter III discovers his ancestor's personal effects, including his cape! Wanting to disguise himself, Carter rummages thru the attic and dons a tricorn hat, breeches, buckled shoes, a domino mask, and a shirt which he sews an American flag decal to! Thus garbed, the newly-christened Fighting Yank takes on local saboteurs for "unnamed foreign powers" until December 1941, at which point, the "unnamed" spies became German and Japanese operatives! In a twist, besides giving Carter III his powers, the Revolutionary War ghost pops up to warn or advise his decendant about danger, and even occasionally transport the Fighting Yank garb to the non-costumed (and thus helpless) Carter III, who apparently didn't wear his costume under his street clothes like most superheroes! 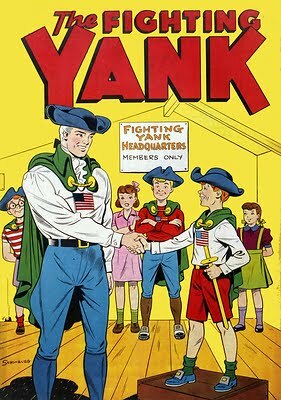 Fighting Yank fought the Good Fight, first in Startling Comics, then his own title and the anthology America's Best Comics, until 1949, when superheroes gave way to an explosion of horror, crime, and Western comics. He was revived in 2001, when Alan Moore brought him back, but quickly killed him off, so he could introduce a NEW Fighting Yank; Bruce Carter III's daughter, while Carter III took over his ancestor's role of ghostly aide to the present Fighting Yank! In 2007, Alex Ross revived the Fighting Yank as the lynchpin for the new Project SuperPowers line of comics which incorporates numerous characters from defunct comic companies into a cohesive universe! 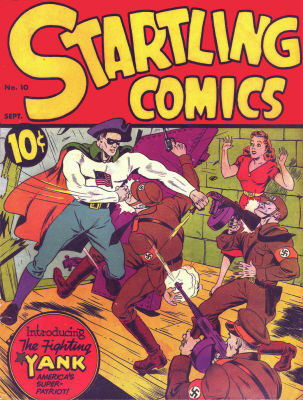 We at Atomic Kommie Comics™ have also revived Fighting Yank, taking the best of his classic 1940s cover art (including his first and last appearances), and emblazoning it on t-shirts, mugs, 12-month calendar, and other kool kollectibles in our Lost Heroes of the Golden Age of Comics™ line! If you want to "fly the flag" in a kitchy (yet kool) way, check out The Fighting Yank! And don't forget Project SuperPowers , the best Golden Age revival on the stands!